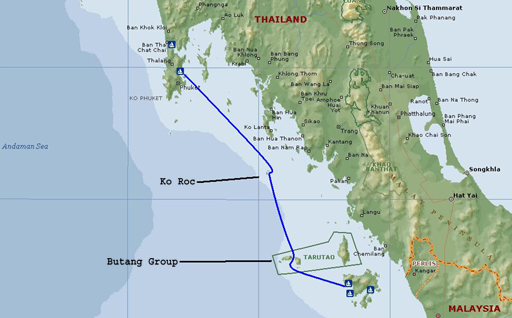 A leisurely sail back to Phuket, was cut short by the discovery of fuel in the bilge shortly after arriving at Ko Roc. The fuel tank was leaking. Since the fuel tank is too large to fit through any opening in the boat various repair plans needed to be explored and decisions made. The next 6 weeks were spent in Yacht Haven Marina at the north end of Phuket, assessing the problem and deciding on a repair strategy. In the end we decided to attempt a repair without removing the tank. This meant a return to Boat Lagoon. 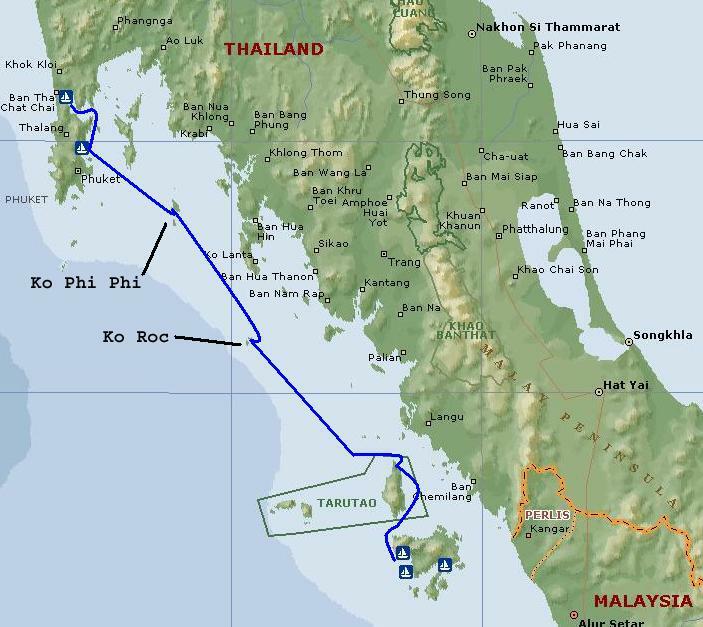 The delay caused by the repairs pushed us into the rainy season, but this may be our last opportunity so we went ahead with a planned three week driving trip in Thailand. 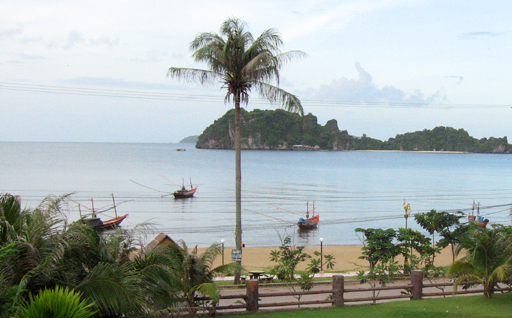 The east coast of the Thai peninsula is attractive and popular with the beach crowd, but being off season, we were able to get this great view on Sai Ri Beach south of Chumphon without advanced booking. 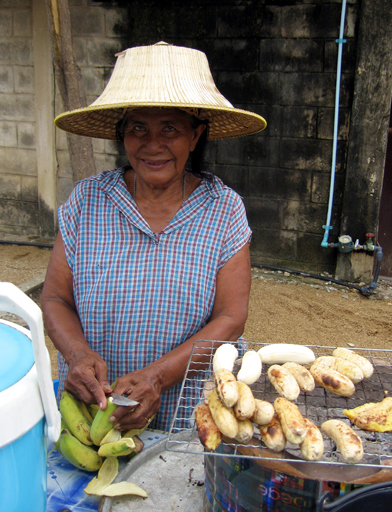 This lady in a traditional Thai sun hat sold us roasted bananas from her street stall near a temple being visited. 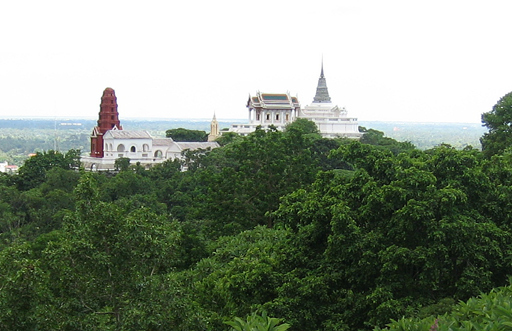 At Phetchaburi, a palace of the G-G-Great grandfather of the current king and a wat sit on top of a jungle covered hill and is now a national park. 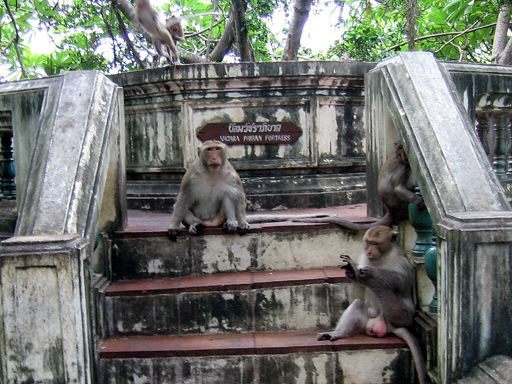 Besides the tourist, park attendants and monks in the wat, this hill is occupied by a troop of monkeys that show little fear of humans. The babies are of course cute, but the larger ones can be intimidating. 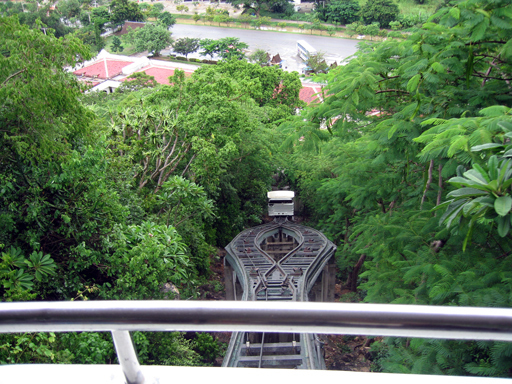 This tram carries tourist to the top of the hill. As we arrived at the upper station a monkey leapt aboard with a loud scream and stole an ice cream cup from a startled lady tourist. 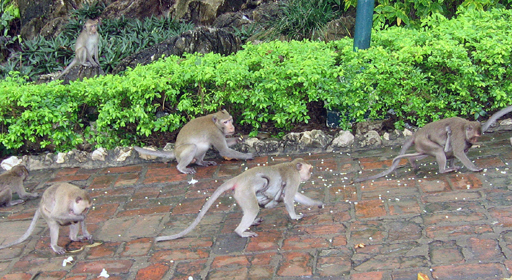 A park attendant surreptitiously scattered popcorn as a treat for the monkeys. Had they seen where the popcorn was coming from she would have been vulnerable to a mass mugging. 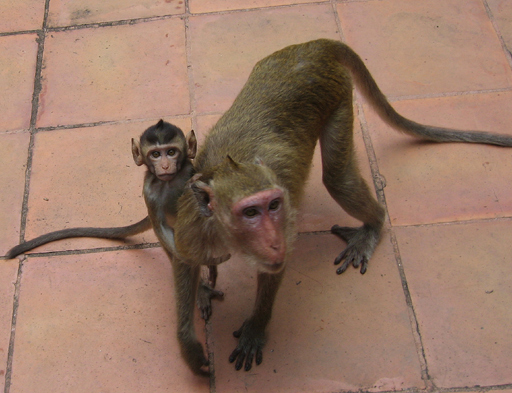 When the staff eat their lunch at out door tables they station one member with a long stick to keep the monkeys at bay. 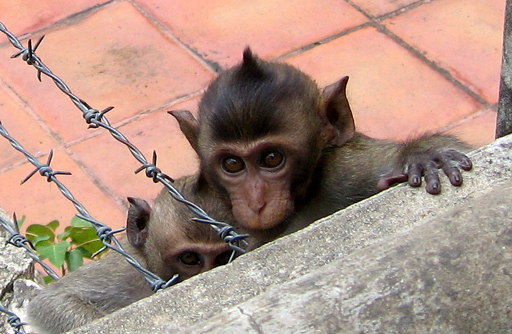 These two alpha males might let you up the steps or they might not. We didn't find out. 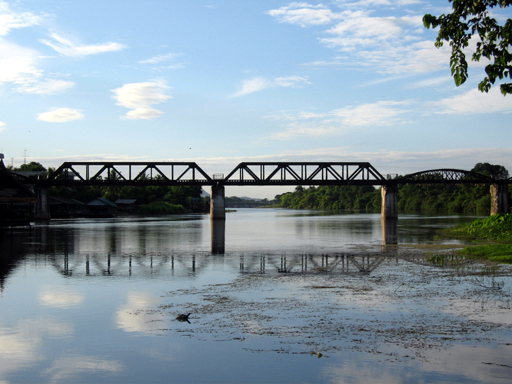 Kanchanaburi is the location of the famous bridge over the river Kwai, part of the “Death Railway” built through the jungles of Thailand by the Japanese army during WWII. The curved span on the right is original, the center and left spans were bombed by American planes during the war and have been rebuilt. 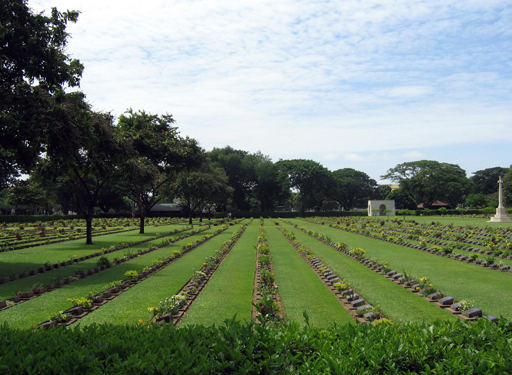 It is estimated that 16,000 POWs died during the construction of the railway, some are buried in this well maintained cemetery and memorial which is across the road from an informative museum on the history of the railway. It is somehow comforting to see that those who died in the jungles of Thailand during the war are not forgotten. 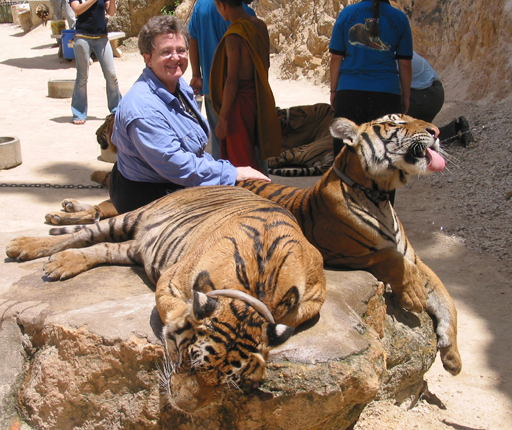 About half an hour drive from Kanchanaburi is the amazing “Tiger Temple.” In 1999 two orphaned tiger cubs were brought to the head monk. The monks raised these cubs in the temple. Soon more orphaned cubs were brought in (probably orphaned by poachers). 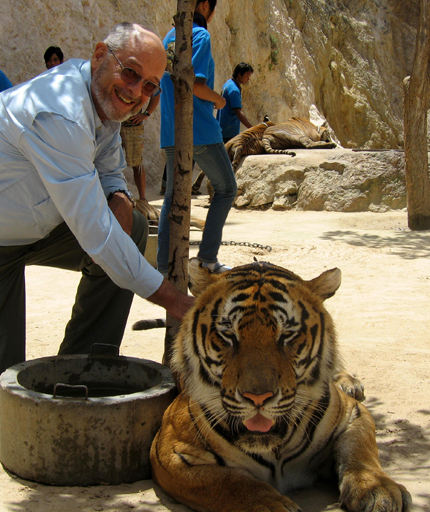 When we visited there were nine full grown tigers living at the temple with two cubs about two years old that had been born there. 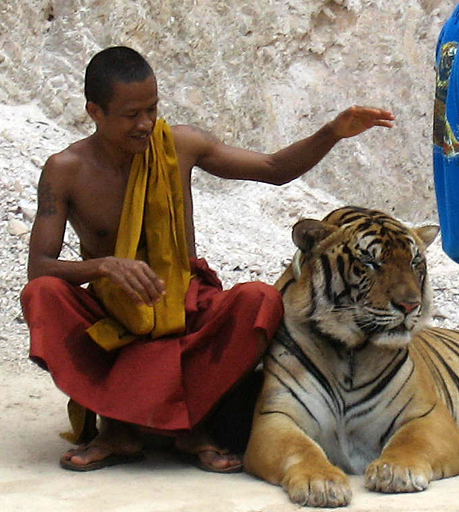 To help raise money for the care and feeding of 11 tigers, the head monk charges tourist a fee to see and under close supervision, pet the tigers. Okay, these are hand raised tame cats, but they are still full grown Bengal tigers and being that close to one was a special experience. 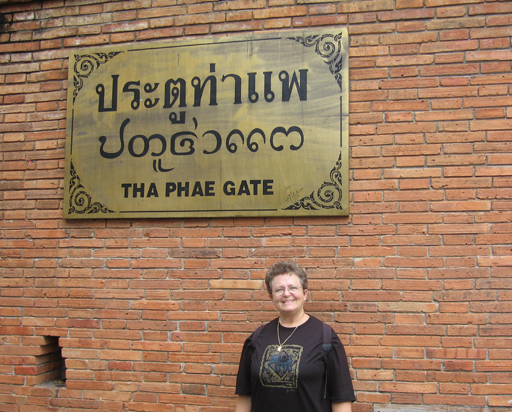 Jane standing at the walls of Chiang Mai, the center of one of the earliest Siamese Kingdoms. 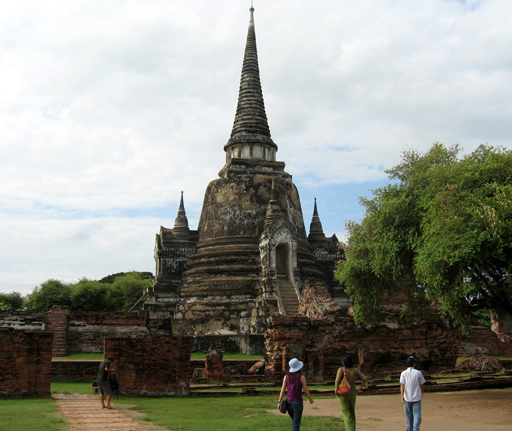 The city is filled with historic wats, palaces and museums and some of the finest dinning in Thailand. 45 miles north of Chang Mai an interesting series of interconnected caves run some 6 miles into the 7500ft Doi Chiang Dao mountain. 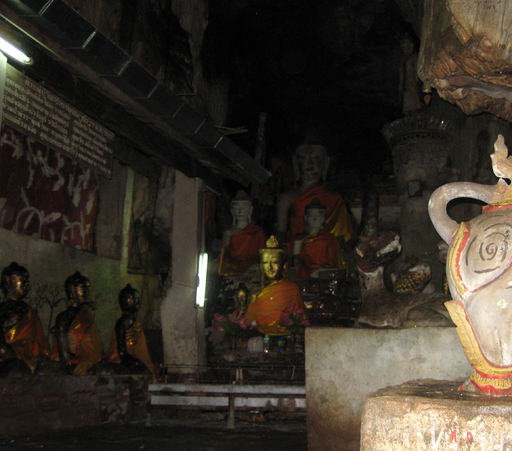 Several are easily accessible by non-spelunkers and in one is an elaborate temple. Within Thailand, Myanmar, Laos and Cambodia there are diverse ethnic groups living in the mountains. 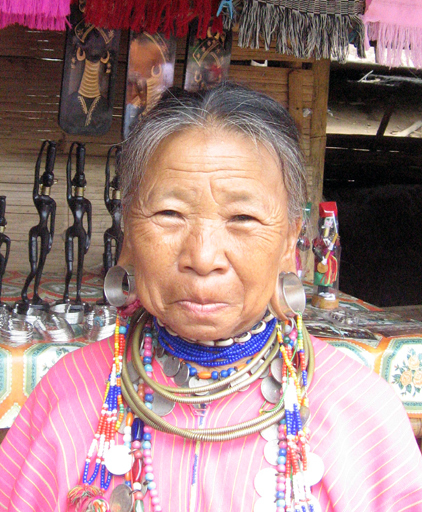 They are collectively known as hill tribes, but they are ethnically and culturally distinct. They have distinct languages, religious beliefs, and dress. The lady on the left is distinguished by the large ear plugs. The lady on the right by the handmade silver adornments, normally only worn for festive occasions. 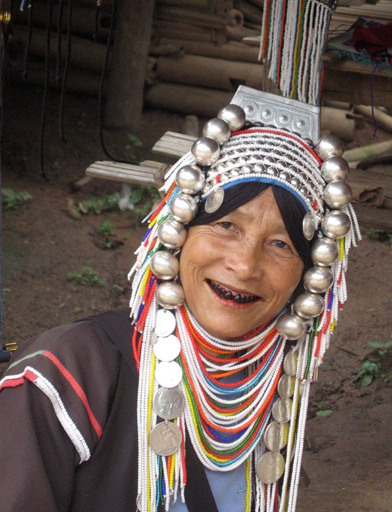 She also has betel nut blackened teeth, we were unable to learn whether or not this is a tribal distinction. 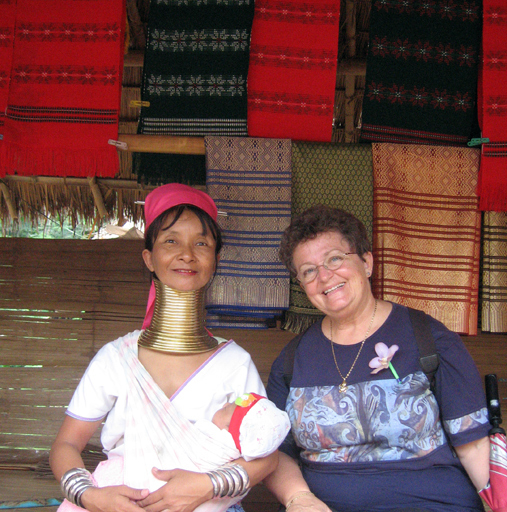 The long neck women are probably the most widely known of the hill tribes. 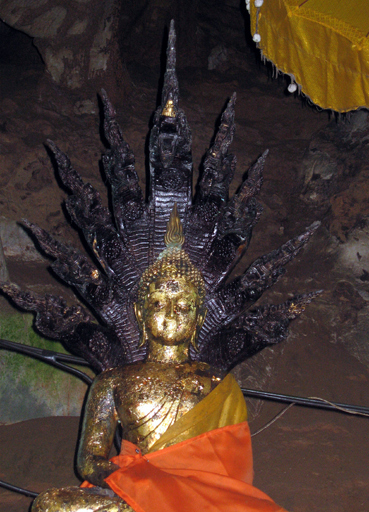 The coils around their necks are one continuous bronze rod of about 3/8” in diameter. It is quite heavy and uncomfortable. Some of the young girls used cloth pads to reduce the pain on their collar bones. 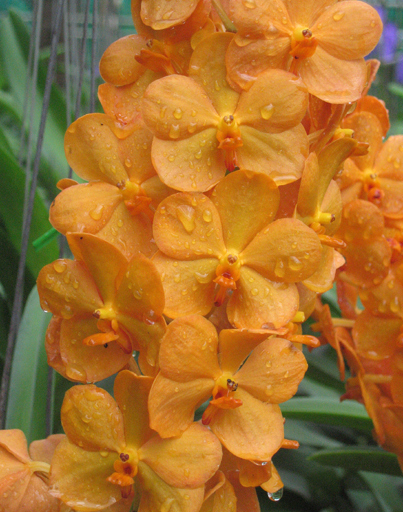 Orchid production is a big industry in Thailand and specially in the north. 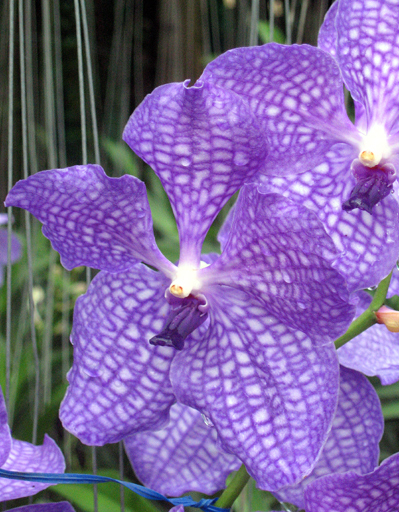 The variety, color range and just sheer beauty of these flowers is truly awe inspiring. The Maesa Elephant Camp is one of several elephant training camps that offer tourists a personal experience with these magnificent beasts. The days of the working elephant have gone the way of the slide rule but, by putting on shows for tourist, these camps provide income needed to support the elephants, the mahouts and their families. 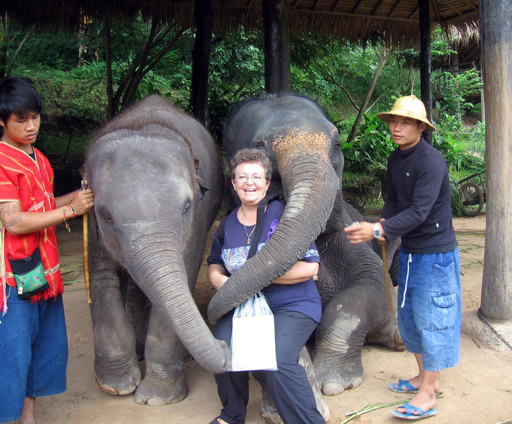 The elephants here were well cared for, healthy and long lived. 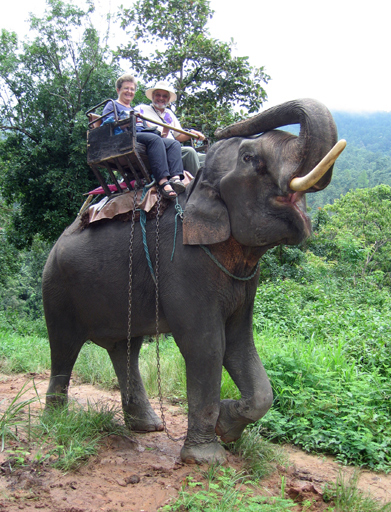 This female was 26 years old and her mahout had been with her for 14 years. 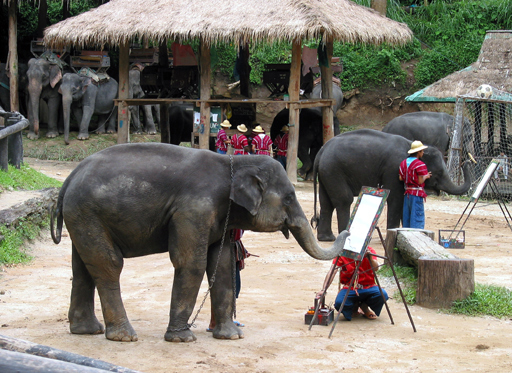 Mahouts are assigned elephants at an early age and may stay with an elephant for life. The little guy on the left is probably five or six, the one holding Jane on its knee is somewhat older. Part of the show was the elephants painting pictures. We are not talking about abstract blobs of paint on paper, but recognizable paintings, one even drew a picture of an elephant. It was amazing. 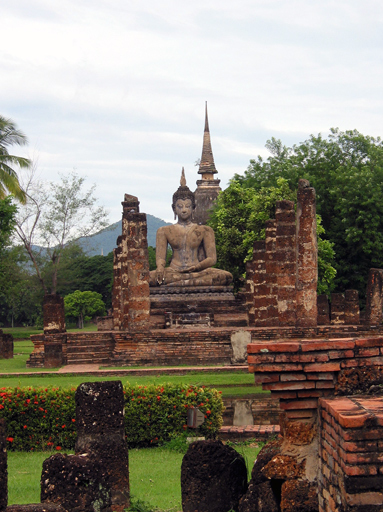 Sukhothai is considered the oldest Thai Kingdom, It was established in the waning days of the Khmer Kingdoms of Angkor in 1238AD. The ruins of the old capital have been turned into an attractive historical park. Jane is dwarfed by this imposing 50ft. 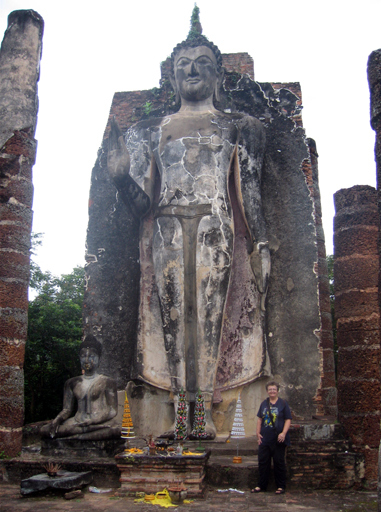 Buddha which stands at the top of a 650ft hill overlooking the plain of Sukhothai. 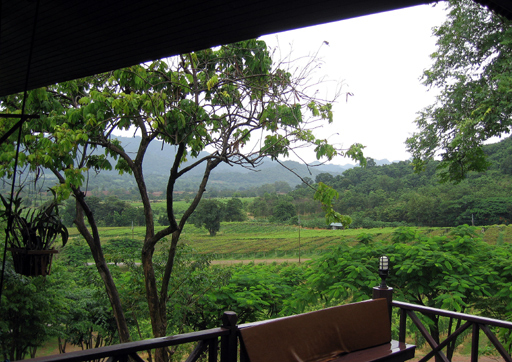 Thailand has a nascent wine industry and we spent a day at a winery checking out their products and enjoying the views in their beautiful valley next to Khao Yai National Park. 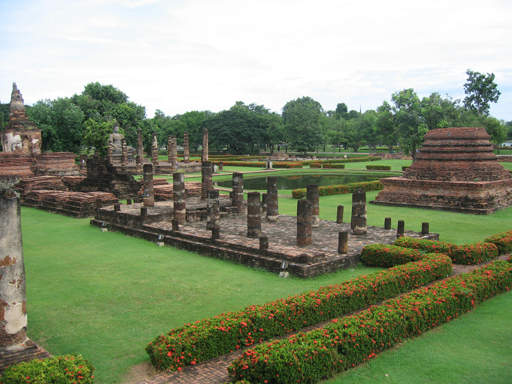 Ayuthaya is the old capital of another Thai kingdom that defeated the Angkor Kingdom in 1431 and was itself destroyed by the Burmese in 1767. Given the opportunity jungle will reconquer lost ground, but at least it takes prisoners. 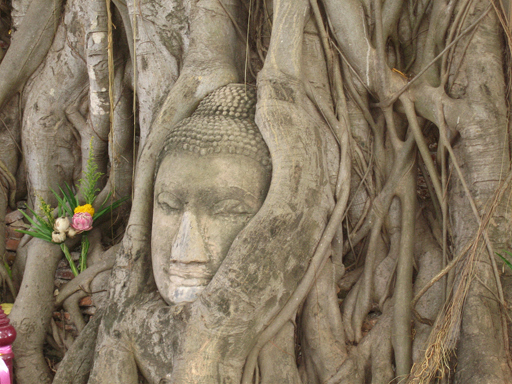 The Buddha statue on the left peeks out of a tree trunk. 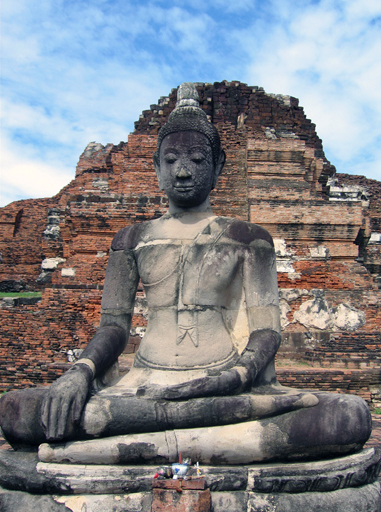 It is considered sacred and a guard makes visitors kneel to approach it. 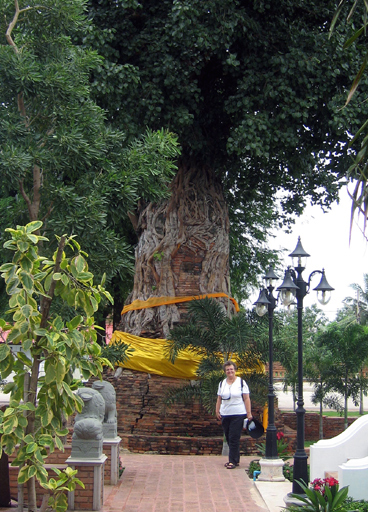 On the right a tree has almost enveloped a stupa. After leaving Ayuthaya we worked our way around north of Bangkok and across to the Myanmar boarder then down the west coast back to Phuket. Walt does pretty good driving on the Thai roads but is not yet ready to challenge the traffic in Bangkok. In October we sailed back to Telaga Harbour Marina in Langkawi, Malaysia. In November we put Callisto on the hard standing at Rebak Marina in Langkawi where she will sit while we travel back to the States for Thanksgiving.